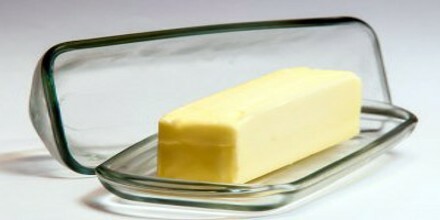 Butyric acid is a carboxylic acid existing in two isomeric forms, one of which produces the smell in rancid butter or plant oils. It has an unpleasant odor and is used in emulsifying agents, disinfectants and drugs. It is found in milk, especially goat, sheep and buffalo milk, butter, parmesan cheese, and as a product of anaerobic fermentation, including in the colon and as body odor. The formula for butyric acid is: CH3-CH2-CH2-COOH. The acid is a liquid at room temperature and is made predominantly of fats. It freezes at 17.8°F (about -8°C) and boils at 326.3°F (163.5°C). Despite its stability, the acid is susceptible to hydrolysis, a chemical process where water molecules get separated down into isolated hydrogen and oxygen atoms, taking with them most any cells to which they are bound. It tends to have a somewhat rancid smell when isolated, and is the primary cause of the foul smell associated with human vomit and flatulence. It is a common addition to stink bombs for this reason. Some of its derivative chemicals and esters are sweet smelling, though; a lot depends on presentation and precise chemical composition. It was first observed in impure form in 1814 by the French chemist Michel Eugène Chevreul. By 1818, he had purified it sufficiently to characterize it. The name of butyric acid comes from the Latin word for butter, butyrum (or buturum), the substance in which butyric acid was first found. Butyric Acid compound is prepared on a large scale by the fermentation of starch or sugar. Fermentation uses microorganisms and takes place under conditions where there is no oxygen to transform the glucose in these compounds. The microbes gain energy from this process. Less energy is produced than if the compounds were transformed in the presence of oxygen. It is industrially prepared by the fermentation of sugar or starch, brought about by the addition of putrefying cheese, with calcium carbonate added to neutralize the acids formed in the process. 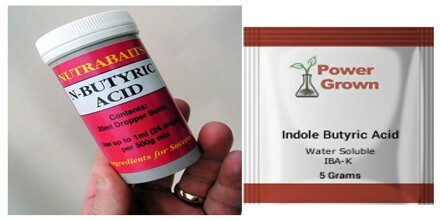 The butyric fermentation of starch is aided by the direct addition of Bacillus subtilis. Salts and esters of the acid are called butyrates or butanoates. In many cases it is also produced as a side product in some marine sediment. Butyric acid or fermentation butyric acid is also found as a hexyl ester hexyl butyrate in the oil of Heracleum giganteum and as the octyl ester octyl butyrate in parsnip (Pastinaca sativa); it has also been noticed in skin flora and perspiration. The colon also produces it as a byproduct of some types of fiber digestion, particularly oats and raw bran. The acid is also often a chief component in vomit, and is usually responsible for its distinctive soured smell. Gamma amino butyric acid (GABA) is a major neurotransmitter in mammals. This is a chemical that relays signals throughout the central nervous system. Many anti-anxiety and anti-convulsive drugs act by increasing the amount of GABA that is available. 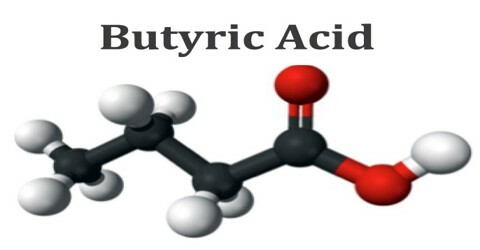 Butyric acid is actually used in the preparation of various butyrate esters. It is also used as an animal feed supplement due to the ability to reduce pathogenic bacterial colonization. It is an approved food flavoring in the EU FLAVIS database. The acid’s foul smell has led to its use in the composition of stink bombs and tools used by police and political activists in many parts of the world. Stink bombs are also used in various protests, usually as a way to cause damage to property or to shut down services, even if just temporarily. Acid attacks have been well documented in abortion clinics, for instance, and against whalers and whaling boats. 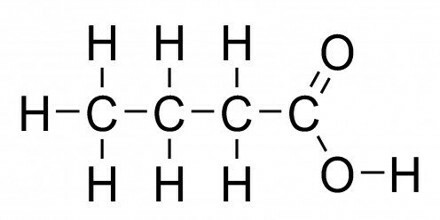 Butyric acid, along with acetic acid, can be reacted with cellulose to produce the organic ester cellulose acetate butyrate (CAB), which is used in a wide variety of tools, parts, and coatings and is more resistant to degradation than cellulose acetate. However, CAB can degrade with exposure to heat and moisture, releasing butyric acid. This process is sometimes observed in the unpleasant, vomit-like odor of aging screwdrivers and other hand tools.